An unacknowledged aspect of the controversy around the Walker Sculpture Garden’s Scaffold is the Dakota elders’ leadership in resolving the conflict. Consider the context. All native people have lived with generations of shame and humiliation from the broader society, from Indian mascots to boarding schools and broken treaties. In this context, the Walker begins to erect the massive Scaffold, depicting several historic gallows. The most prominent feature replicates the gallows used to hang 38 Dakota men in Mankato in 1862. Neither the Walker nor Sam Durant, the artist, thought to talk to Dakota leaders. The sculpture is not only a painful reminder of their worst moment in history, it also shows they are invisible to the broader community, powerless to affect these decisions. That’s a heavy burden. Yes, there was anger and hurt in the Dakota community. But in the end, Dakota elders led a healing ceremony with all parties in the circle. Some have praised Durant and the Walker for agreeing to mediation and ultimately the sculpture’s removal. Yes, Durant and the Walker did the right thing — but they were fixing problems of their own making. In the typical narrative, the Dakota are portrayed as aggrieved victims. It needs to be stated clearly: the Dakota elders were exemplary leaders. They spoke of bringing “positive energy” to the Garden. The Dakota had no institutional power. Their power and leadership came from their moral authority on this issue, which resonated with many of us in the community, both Native and non-Native peoples. We will have to wait and see what emerges from the Dakota-Walker collaboration moving forward. Meanwhile, there remain important issues to reflect upon. One is how to talk about cultural appropriation, the other is removing the veil of the dominant narrative and acknowledging the leadership Dakota elders brought to the table. It raises the question: Should Durant or other white artists be able to appropriate the stories of oppressed people and profit off their pain? This issue is not clear cut. White artists like Durant need to create works that speak to issues of race, racism, and oppression. They should speak to white audiences and audiences of color. I believe Scaffold is a powerful image. The work fell short because Durant didn’t have important relationships to understand the human side of these stories. Durant’s art has engaged in social justice themes. I assumed cultural appropriation would not be a new issue to him. His comments at a May 31 post-mediation news conference were revealing. Comment: Had Durant met with Dakota people on the front end, he probably would have worked through questions of cultural appropriation earlier and in a less-public way. Durant also would have benefited from a “powerful, moving experience” that comes from these relationships, experiences that could have shaped his art. Perhaps it would have resulted in a collaboration. One reporter asked Durant a softball question: In retrospect, would Durant have gone ahead with Scaffold if he had met with tribal leaders first? His response: “I never would have included Mankato in such a piece” (referring to the Dakota 38 gallows). Comment: Surprisingly, Durant seemed to see the problem as unique to the Dakota scaffold, not the larger question of appropriating stories from oppressed people. Ralph Crowder III, a local documentarian who also is African American, pressed that issue. He asked Durant about the portion of Scaffold which represented Rainey Bethea’s gallows. (Bethea was hung in Owensboro, Kentucky in 1936, the last public hanging in our country. Some 20,000 people went to watch Bethea, a black man, be hung by a white female sheriff.) Crowder asked Durant if he could talk about the symbolism of that hanging and sensitivity for the black community, too. Durant didn’t answer the question directly: “The work is really primarily for a mainstream audience that is not aware of these things,” he said. Comment: Again, an interesting answer. Durant’s target audience is people who don’t know history. Where does that leave the people who know the history and who are most profoundly affected by it? This is not to shame Durant. Many white people, myself included, are in the same boat, lacking important relationships in our work and daily lives. This controversy reflects a much broader problem. Comment: Olga Viso, Walker’s executive director, said in an interview that Walker does not have a policy on cultural appropriation, except as it relates to historic artifacts. It’s impossible to write a policy that would fit every situation, but it would be good to have something in place as an institutional reminder that these conversations matter. The language around this story holds thinly veiled reminders of who has power and who does not. 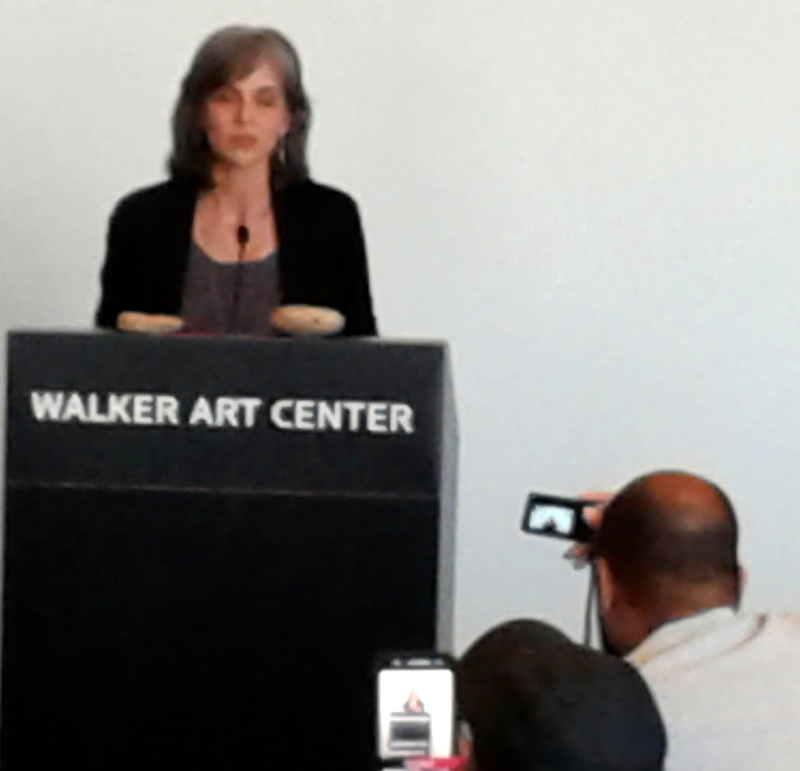 Olga Viso, Executive Director of the Walker Art Center. Comment: Consultation is a low bar. (Native nations can be “consulted” about oil pipelines, but it doesn’t stop the pipelines.) Had Durant or the Walker “consulted” about Scaffold, it might not have solved anything. They quickly would have found out the Dakota wanted a lead role in any project around the Dakota 38. It would have taken collaboration, which is where things ended up anyway. Viso talked about “rebuilding trust” with the Dakota community. Comment: It seems like an innocuous way to express a desire to work together, but in this case it’s very misleading. It refers to a mythological period when the Dakota felt “trust.” It never existed. Framing the issue as “rebuilding trust” obscures the Dakota’s long history of reasons not to trust — being cheated, abused, exiled and killed, or simply ignored. Durant has agreed never again to create the Dakota gallows. 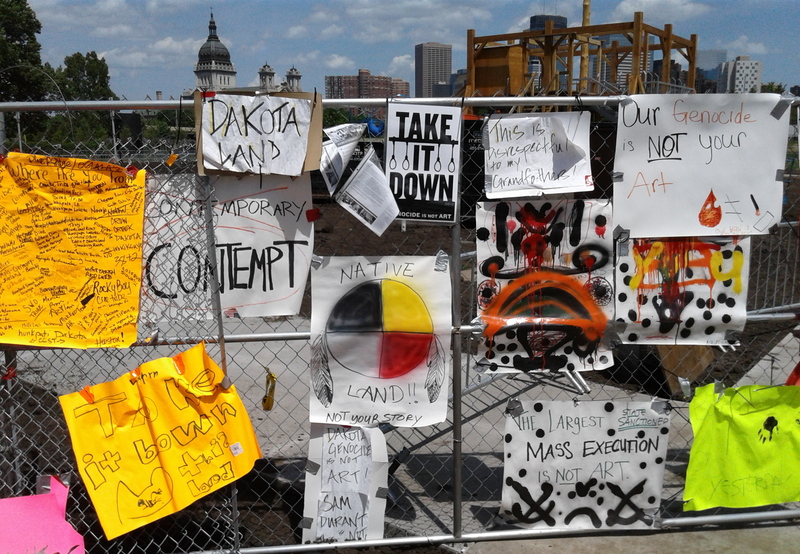 He said he would transfer the “intellectual property rights” to Scaffold to the Dakota Oyate. Comment: Yes, that’s a good thing. At an intellectual level, I understand why we have intellectual property rights. Still, there is something funky about the idea that Durant has the right to claim a replica of the Dakota 38 gallows as his intellectual property to give. The controversy around ‘Scaffold’ is one of the few times I’ve seen these difficult conversations actually come to pass in a useful, thoughtful, and productive way — and it happened because Sam Durant and the Walker were able to recognize that listening is an essential part of speaking freely. Comment: This outcome did not happen because of Durant or Walker. The Walker was ready to open the new Sculpture Garden with Scaffold as a key new acquisition. This outcome resulted from the courageous leadership of Dakota elders. The Dakota elders are my heroes. 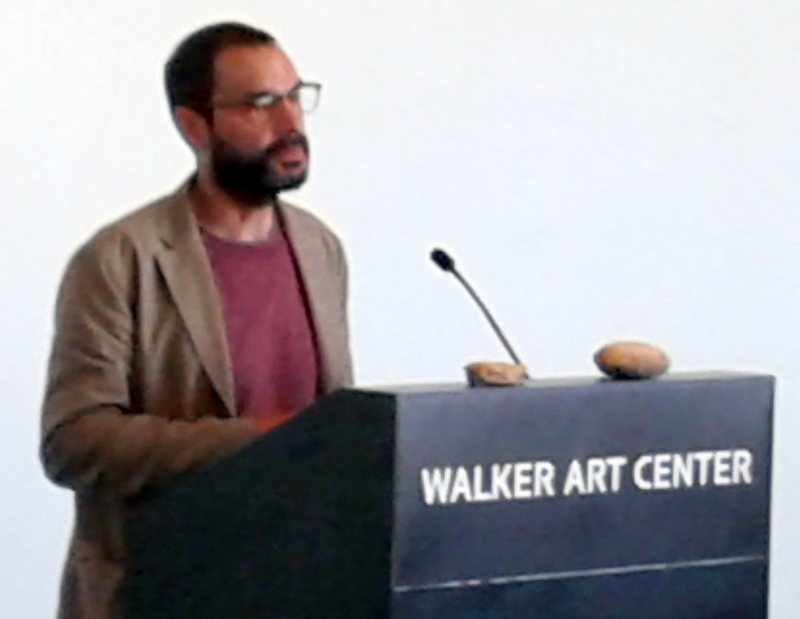 I hope their courage results in long-term authentic collaboration with the Walker. This is the only article in the white press regarding the debacle that serves the Dakota people. Thanks for your insight.